Automation Serveruses a database server to store your processes and their related data. Microsoft SQL Server is supported for database server configuration. You need to install and set up a SQL Server instance, ensuring you comply with the information below. For Automation Server, supported editions are Standard or higher. SQL Azure is not supported. 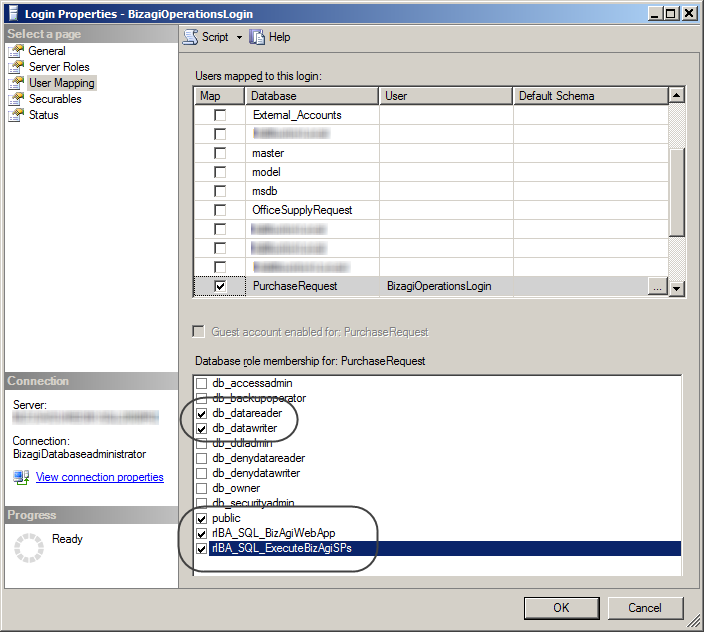 Make sure that SQL Server authentication mode is enabled for your database instance (in mixed mode), at least initially to create a Bizagi project. You may later choose to authenticate users based on Windows authentication. Make sure the TCP/IP protocol is enabled for your instance, and check for recommended settings such as establishing an explicit TCP/IP port (instead of using dynamic ports) and allowing remote connections when needed. 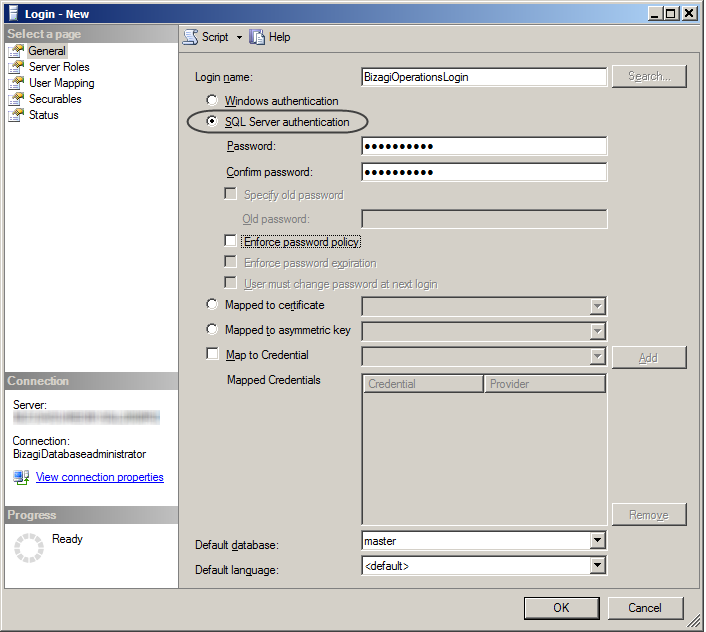 You need one authorized login account using SQL Server authentication and having the required rights for processes execution (for Bizagi's database). A separate login account having sysadmin rights is required for administration tasks. Carry out these steps, to make sure that your SQL Server instance is set to work with Bizagi. To verify the configuration of your SQL Server instance (or to set it up), you need these SQL Server client and configuration tools. 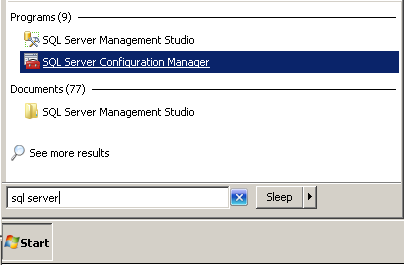 SQL Server Management Studio and SQL Server Configuration Manager. 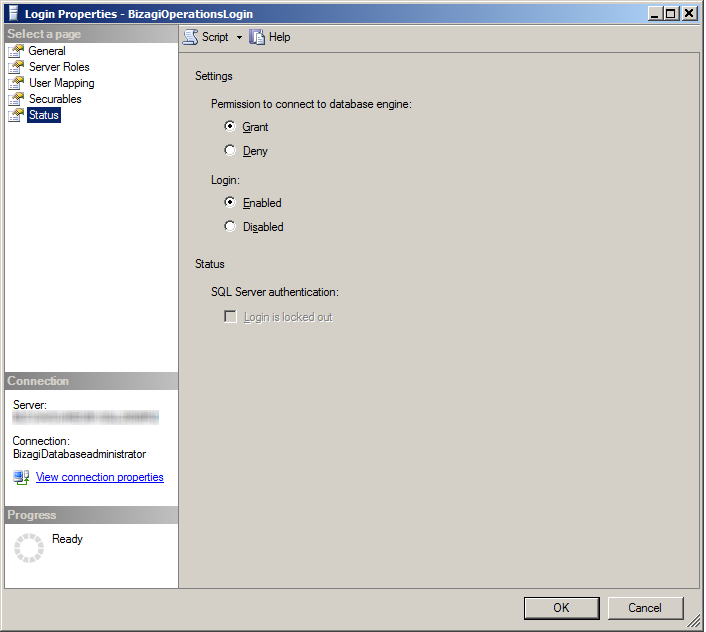 Both tools can be included when installing the SQL Server database. If your SQL Server version does not include the SQL Server Management Studio, you may download and install it directly from Microsoft's official web site at no cost. 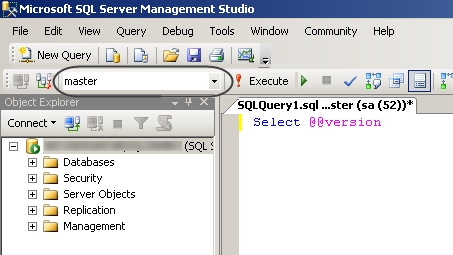 To determine the version of an installed SQL Server, use the SQL Server Management Console. •Additional details about the SQL Server edition and bit support. Check or configure the following requirements. 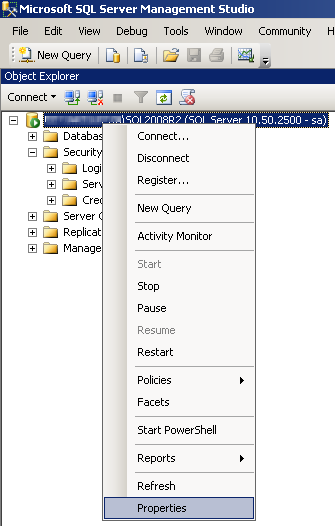 Run the SQL Server Management Studio. 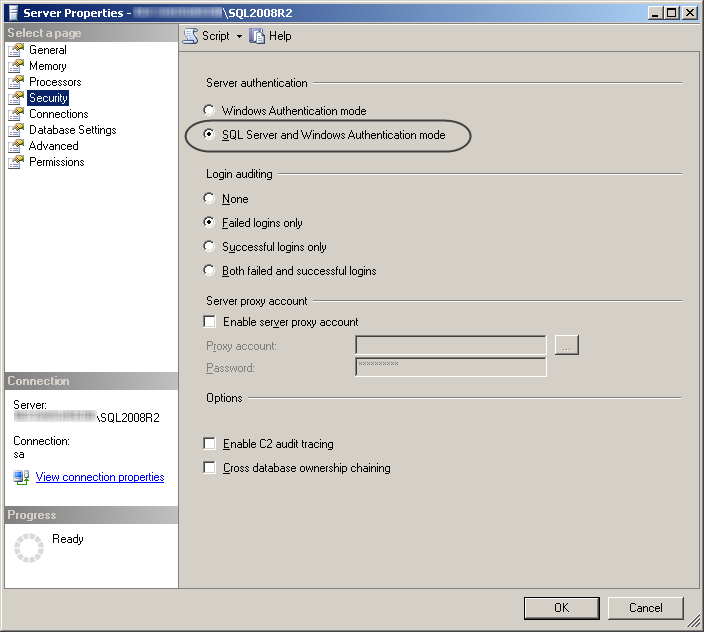 In the Security option, make sure that the SQL Server and Windows Authentication Mode is checked and then click OK.
Run the SQL Server Configuration Manager. Enable the TCP/IP protocol for your database connection by locating the specific database instance (under the SQL Server Network Configuration). Changing these settings may require restarting your database service. The TCP/IP port configuration requires that there is no firewall rule or corporate security software blocking the port used for your database connection. For remote connections, configure the Allow remote connections property. This property can be reviewed or activated through the SQL Server Management Studio, and in the database instance's properties. 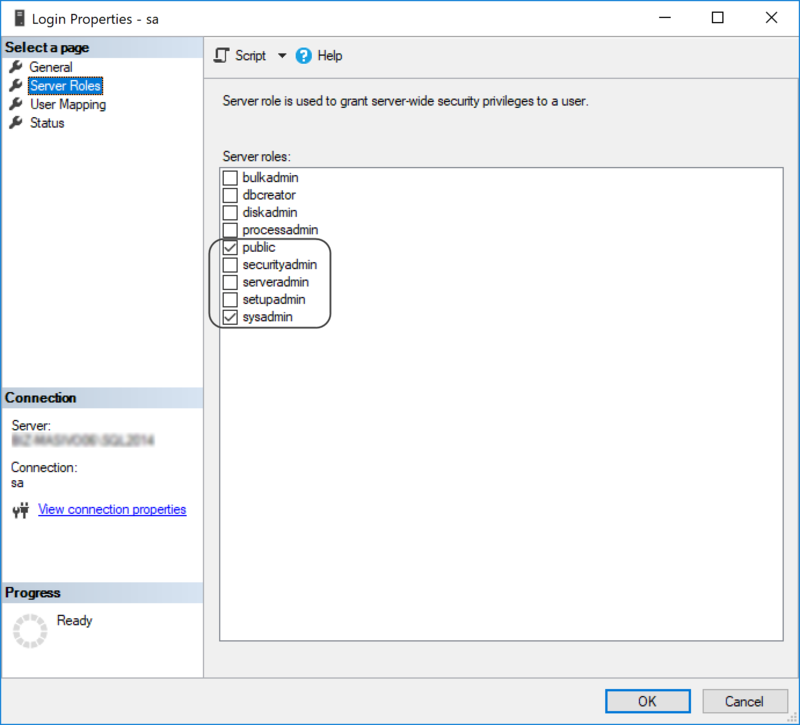 While using the SQL Server Management Studio, make sure you can rely on an account that has sysadmin rights (e.g., with the sa default role). With this account, you can create the Bizagi database. •Sysadmin user for the Management Console. •Public user for Work Portal and the Scheduler. You can configure a different account to administer for the Bizagi database. 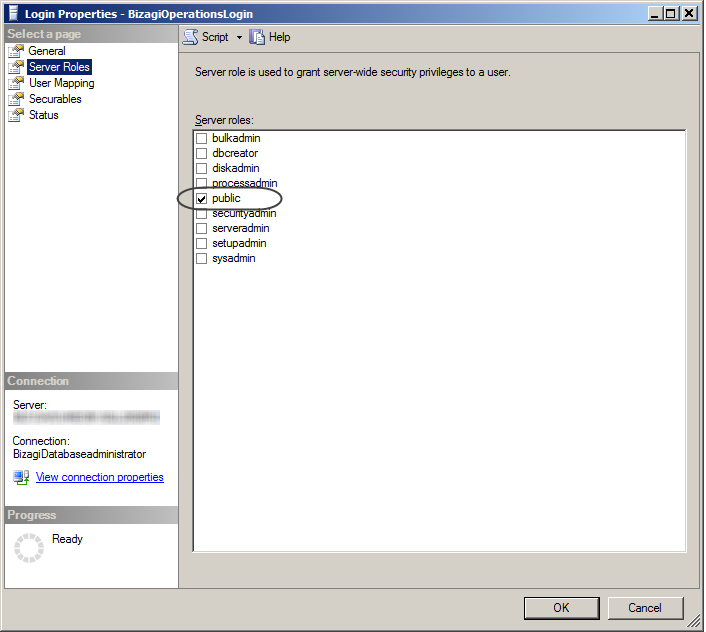 •The server roles specified for this login must include: public. •The login must include the following user mapping items for that specific database: db_datareader, db_datawriter, public, rlBA_SQL_BizagiWebApp and rlBA_SQL_ExecuteBizagiSPs. The db_datareader, db_datawriter, public, rlBA_SQL_BizagiWebApp and rlBA_SQL_ExecuteBizagiSPs user mappings apply for your project's database. This means that you need to apply these mappings once your Bizagi production environment database has been created. Recall that in order to create that Bizagi database, you need to have previously used a sysadmin account. You may modify or review that this SQL Server account login, is used in the connection string of the Work Portal and the Scheduler connections, by editing their corresponding configuration files. •The connection for the Work portal is modified, by editing the web.config located at the Web application folder of the given project environment (by default at C:\Bizagi\Projects\[PROJECT_NAME]\WebApplication). •The connection for the Scheduler service is modified, by editing, the Bizagi.Scheduler.Services.exe.config file located at the Scheduler folder of the given project environment (by default at C:\Bizagi\Projects\[PROJECT_NAME]\Scheduler).